Now is the time to forage (carefully!) for nettles or find them at the farmers market. Thanks to Marcia Newlands for bringing this spring recipe to our attention! Blanched, nettles will keep their emerald loveliness even after a good 15 minutes of cooking, which makes this risotto visually stunning. The dish itself is pretty simple: Risotto rice, cooked nettles, butter, shallot, garlic, a little pecorino cheese and beef stock. The basic structure of this risotto holds with all sorts of variations. You could use a different grated cheese, such as parmigiano or a Greek mizithra. 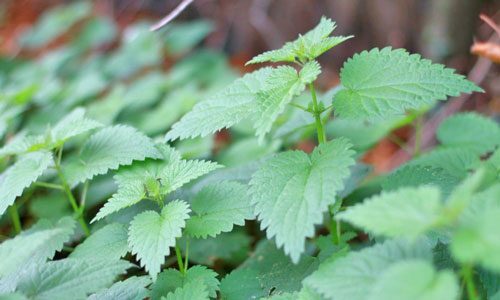 Note: Depending what variety your nettles are, you will need four or five big tongs-fulls of fresh nettles to get your cup of cooked nettles. Regular nettles (urtica dioica) are more substantial than their daintier cousins, the dwarf nettle (urtica urens) and retain more of their volume when cooked. I say tongs-full because you do not want to pick up fresh nettles, as they will sting you. Thus the name. Get a large pot of water boiling and add a handful of salt. Add the nettles. Stir and boil for 1-2 minutes for dwarf nettles, about 5 minutes for regular nettles. When done cooking, dump them into a big bowl with ice water in it. Once they are cool, put them in a colander to drain. Put the nettles in a clean tea towel and twist to squeeze out as much moisture as you can. Chop the nettles finely (a food processor will turn them mushy). The finer you chop, the smoother your risotto will be. Remove any stray stems. To make the risotto, heat 2 tablespoons of butter in a large heavy pot set on medium-high. Wait until the butter stops frothing and add the shallot. Cook for 2-3 minutes, stirring often. Add the garlic and rice and stir to combine. Stirring constantly, cook for a minute or so or until all the rice is well coated with butter. Add 1 teaspoon of salt and the first cup of stock. Turn the heat to high and stir in the rice. When it starts boiling strongly, turn the heat down to medium and stir often, at least every minute or so, until the rice absorbs the stock. Repeat with a second cup of stock. When the second cup is absorbed, add the nettles and the third cup of stock. Stir well to combine. Keep stirring constantly to develop the creaminess in the risotto. Taste the risotto, and add salt if needed. It may need the remaining cup of stock, as you want the dish to be loose. Add the butter and cheese and cook for an additional 4-5 minutes, stirring often. Serve at once.